A simple thought has been tumbling around in my mind lately as I see different articles & pictures here and there about beauty and self-image, and as the subject comes up in conversation with other women. The thought is this: my beauty does not depend upon how much more [fill-in-the-blank] I am than somebody else. Feeling, looking, or being ___________-er than the next girl (or boy) is not a healthy place to turn to for our confidence. I would also say that we should be wary of basing our self-image upon how close we get to looking like the images we are bombarded with every day. These mental patterns are associated with comparison and competition, both of which are deeply rooted messages in our culture, not just now, but in the past. The medium may change, but these messages have been around for generations. We humans are naturally inclined to categorize and compare; it’s part of how we make sense of the world, and in many ways it is necessary to do this! But in a fallen world there is a dark side to everything, and I believe that the enemy of our souls loves to see women and men trapped in the lie that you’re only beautiful or worthwhile if you measure up to impossibly high standards. I think we are making strides toward healthier attitudes about self-image, and I am pleased to see broadening definitions of beauty, creativity, coolness, success, etc. but as long as there are definitions (and there always will be), people will be excluded from them. Basing our worth on measuring up will always cause us to come up short. The truth is that each of us was created wonderfully and uniquely by a loving, all-knowing God (Psalm 119 is a great place to start exploring this idea in Scripture). Each of us has worth, beauty, gifts, talents… things to offer the world. I’m sharing this today because I recently caught myself, once again, stuck in the comparison trap. I glanced in the mirror as I headed out the door to walk the dog and thought, “I look cute!” BUT. A scary process happened in my head in that split second, and I thank God for the wherewithal to recognize it: the image I saw in the mirror lined up with images I had seen over time that are associated with cultural standards of beauty, and that was what led to my thinking I looked good. My brain scanned my reflection, looking for matches in its digital library of other people and went “check, check, check….” for each matching characteristic. Here’s where I get super deep (haha): that made me sad. 😦 I want to be at peace with how I look and who I am because of how God made ME, not how I stack up against others. And I think it truly was the Spirit who helped me recognize the false self-esteem calculation that was going on in my mind, so I will rely on him to renew my thoughts in this area. Looks don’t matter as much as our hearts, our minds, and our actions, but self-image is still a piece of the puzzle, and when it’s out of place we can get distracted from what matters most. I created a cheesy little image (using Rhonna Designs, such a cool app!) that I hope will provide inspiration as we head into another summer weekend. There is so much to do and so much to enjoy! But as you head out to enjoy this world and this life, take a quick look at what makes you YOU, and embrace it! 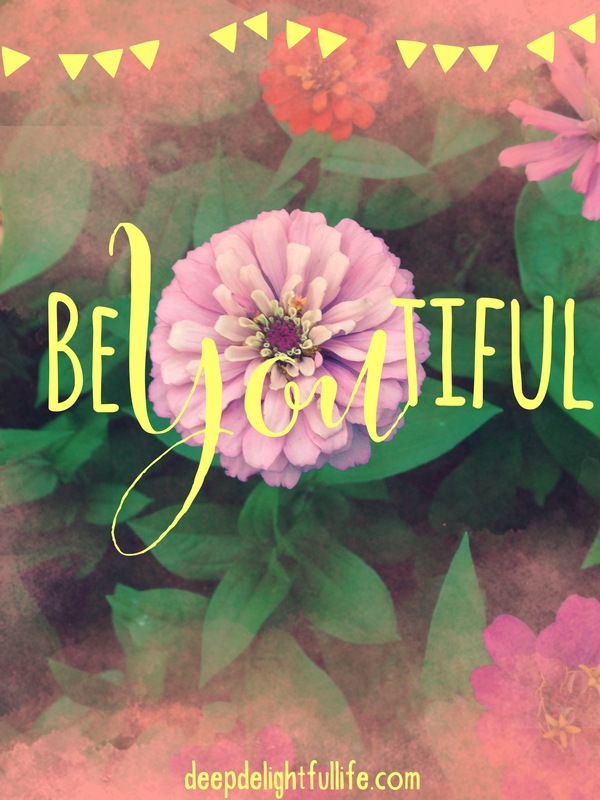 Look at yourself as someone beautiful and gifted in his or her own right, because you are. I think looking at ourselves this way can make a difference in our own minds and hearts, and in the way we see others, but it will also make a difference in the world around us. the image is my own. text and decorations are from the Rhonna Designs app.